Hey Synaptics, Can You Please Stop Polling! TL;DR – be wary of buying a Lenovo laptop or any other laptop that uses a Synaptics touch pad until Synaptics ships a fixed driver. Their driver has a memory leak and they have a battery-life bug that causes Windows to repeat the same system-scan once a second. So far Synaptics has failed to respond so the wait for a fix must be assumed to be infinite. Update: October 15, 2017: an updated driver for my laptop was released September 11, 2017, six days after I published this post. However I have yet to see the driver on Windows Update, Lenovo’s System Update, or in any communications from Lenovo or Synaptics. So, I don’t know if or how ‘normal’ customers are supposed to get this fix. I only found out through the kindness of a stranger. My new laptop has great battery life and I want to keep it that way so if I notice something consuming CPU time for no good reason I investigate. If it’s a web page with battery-wasting ads I close it, and if it’s a process that keeps doing background work I’ll kill it. So, when I noticed that Task Manager said that WmiPrvSE.exe was consuming ~0.7% of my CPU time (~5.6% of a core) continuously I investigated. Poking around at the trace a bit more I also noticed that tzrez.dll is opened 676 times whenever WmiPrvSE.exe springs to life and tzrez.dll.mui is opened 338 times, which would explain the LoadLibrary and LoadString costs which make SetDateTime so expensive. It looks like there are some easy optimization opportunities here for Microsoft. But, why is this code springing to life every 1.2 seconds? This is just the WMI service enumerating Win32_Process instances. You need to find the client process doing the queries to find the culprit. Who is doing this query? I suggest recording Microsoft-Windows-WMI-Activity, it should have events for the client issuing the queries. A polling query is particularly tragic in the case of Win32_Process, since Win32_ProcessStartTrace does the same thing without polling. But I think unsecapp.exe would be readying the client, if you rapidly create processes to make the notification query have results. That explained why I could see no signs of results being sent to the client process, because I was recording my traces on an idle machine with no processes being created. unsecapp.exe readies four different processes: itself, svchost.exe (3228), System, and SynTPEnh.exe. One of this must be the process that created the polling WMI query, and the only one it can be is SynTPEnh.exe, signed by Synaptics Incorporated. I killed the SynTPEnh.exe process but it came back to life like a digital zombie. So I killed its friends (SynTPEnhService.exe and SynTPHelper.exe) and then killed it and this time it stayed dead, and WmiPrvSE.exe finally stopped its work! The ClientProcessID identifies which process made the query. I’m not sure I could have found the right query if I didn’t already know what process ID I was looking for. If this is the easy way of tracking down who made these battery-depleting queries then maybe it needs to be made easier. What about that memory leak? When I’d first noticed that SynTPEnh.exe was leaking memory I couldn’t reproduce it, but this investigation gave me a new idea: maybe the new-process notifications were related to the memory leak. I happened to have a process creation stress test lying around from investigating a Windows 10 performance problem so I ran it. To nobody’s surprise running it caused the SynTPEnh.exe private working set to increase by about 20 MiB – about 20 KiB per process (technically ~20.5 KiB per process because base-2 is so awesome). In other words, the memory leak was exacerbated by being a Chrome developer and by investigating the Windows 10 performance problem. It’s safe to say that I was hit worse than anyone. But it still needs fixing. I used Synaptics’ “Contact Us” form to report these bugs and I tweeted information to them but I have heard no response. I also contacted Lenovo since they are the maker of my laptop. They responded but I’m not sure how seriously they are taking the issue and I don’t feel like experimenting with driver versions that “might” fix the issue. Microsoft suggested that they could use shimming to fix the issue. And they encouraged me to file a feedback report, which I did. I’m not thrilled with shimming as a solution, but unresponsive developers is the perfect use-case for it. I’m not the first person to notice this. The bug was reported to Lenovo on May 30th and May 31st. Various suggestions were made but the issue can’t be considered fixed until an automatic update goes out to all customers. So, my laptop battery life is now back to normal, until the next update comes along. But a few million unwary customers are still wasting power and memory until this issue is fixed. Apparently Lenovo has fixed this for at least some Yoga machines. One reader suggested that uninstalling the Synaptics driver and using the Microsoft Precision Touch Pad drivers might work better. An alternative WMI investigative technique was suggested here. This entry was posted in Investigative Reporting, Uncategorized. Bookmark the permalink. 31 Responses to Hey Synaptics, Can You Please Stop Polling! 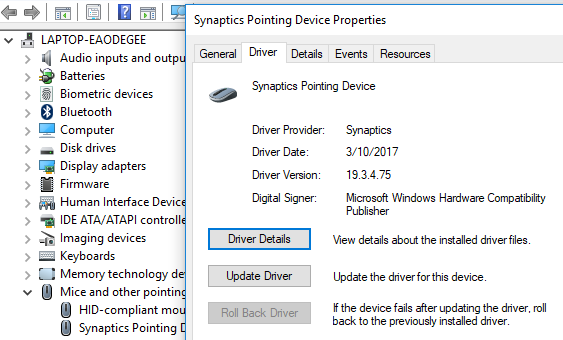 Are all users using the synaptic pad with this driver affected? I don’t know why the P51 hasn’t received updated drivers yet. Curious: Does ‘powercfg /energy’ give any useful output here, or is the wasted CPU hidden from its analysis? I think powercfg /energy just shows that WmiPrvSE.exe is using too much CPU time without indicating why. Pity. Is it still behaving that way if mouse is plugged in and touchpad option is set to disable when external pointing device is used? I think you mean tzres.dll when you say trez.dll. What would you suggest, event wise, be added to make tracking down the initiators of WMI notification queries easier? I guess adding the PID of the notification query initiator to the event for the “polling query” done every interval would go a long way. D’oh – fixed. Writing is hard. I’d like to see a WMI event issued every time that the query happens. That would make finding the culprit in an ETW trace or in event viewer much simpler. Only emitting these events when the query is initiated seems perverse, at least in this context. Very good analysis and use of Windows Performance Toolkit to troubleshoot performance issues. I got it instantly as well. Have you tried searching e.g. “synaptics engineer touchpad” on LinkedIn? This is what I usually end up doing when I’m unable to reach the relevant people through normal support channels. I messaged someone (Perry) on your behalf, I’ll let you know if they respond! The issue isn’t resolved until the fixed driver is on Windows Update for everyone. Contacting Lenovo/Dell/whomever is a non-starter because the vast majority of users have no way to realize that they have a problem that requires contacting Lenovo. Thanks for this blog post- I knew I wasn’t going crazy when my laptop suddenly started having awful battery life. If I had a dollar for every time I ran powercfg /batteryreport to try and figure out what the heck was going on, I’d be rich. So, yeah, can you do that? That will help Dell help you, and perhaps help them help lots of other people. Thank you for the information you posted! I have forwarded this information to our BIOS team to check. Sorry, it should be touchpad team, not bios team….sorry to make a mistake in writing. It’s still not fixed for my Lenovo P51, but the fixes for other systems are an encouraging sign (as long as they go out through an auto-update system). It is also frustrating that Lenovo couldn’t tell me the state of this bug when I asked, and Synaptics never even responded. Lenovo brand and its products should be avoided at all cost. The badly behaved version was 19.3.4.83, so clearly a driver upgrade had happened and that caused this problem. This is exactly what I was afraid of when Microsoft announced their plans to have Windows 10 update drivers automatically. Microsoft Update has a long history of delivering (obviously) bad drivers; I once had Windows 8 try to update my Bluetooth driver with one that didn’t even have “Atheros” spelled correctly. My HP Envy 17 laptop (3 years old now…) has a Synaptics trackpad and the same rubbish 64-bit extension thing. I too found over the years that occasionally it’d go bad for a while and then not. I just got used to killing it in Task Manager, and if it was particularly bad, finding the scheduled task that started it on logon and disabling that for a while. My new Thinkpad has a Synaptics trackpad but it’s a precision one so it doesn’t seem to need the same “helpers”.